Short selling is a crucial tool in any trader’s arsenal, but something that is often confusing for those new to trading. If you would like to have short selling explained, you are in luck. 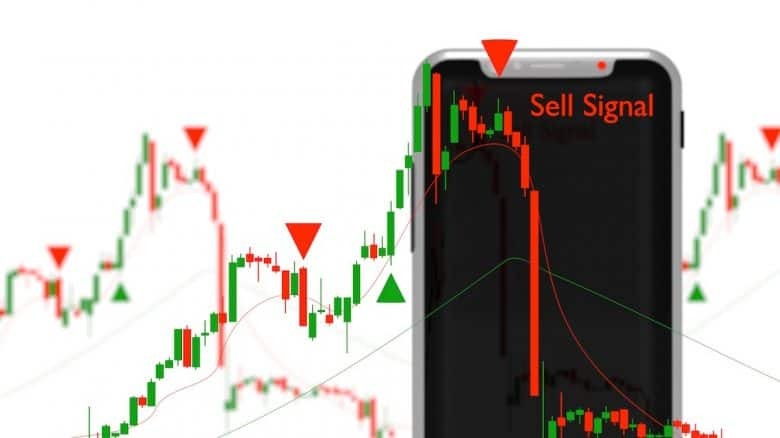 This trading guide covers all the reasons for short selling, the mechanics of short selling, how to spot opportunities to sell short or profit from a short squeeze, and the risks to be aware of when shorting stocks. Let’s start our trading guide with a definition of what short selling is. Why do traders short-sell stocks? Usually when traders or investors sell a stock, it will be a stock they have previously bought and currently own. However, buying and then selling a stock only allows traders to profit from rising prices. 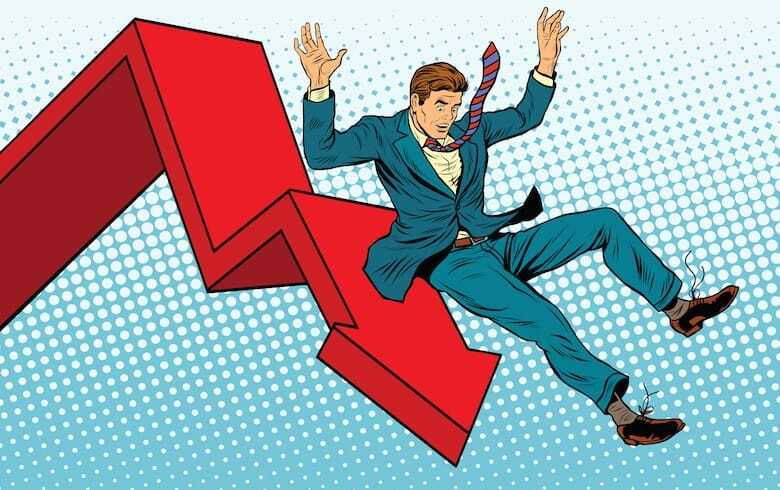 To profit from falling prices, a trader has to first sell a stock and then buy it back at a lower price. If traders buy a stock they have a long position, whereas if they sell a stock they do not own, they have a short position. Before shorting a stock, a trader has to borrow it, then sell it. This leaves the trader with a short position – which is a bit like a loan. To close the short position, the trader buys the stock back (which is known as short covering) and then return the stock to the lender. Ok, in the next section you’ll learn why traders open short positions. There are actually numerous reasons for short selling stocks. 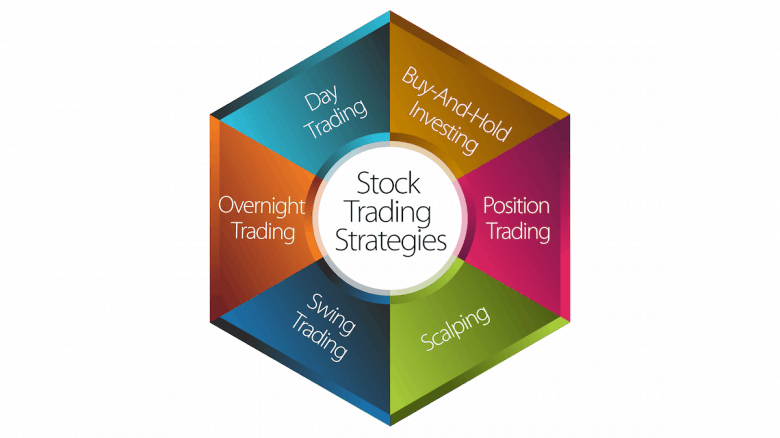 The reasons for shorting a stock vary based on the type of trader and the underlying trading strategy. Short term traders short sell stocks when they think a stock price is too high, or when they see momentum slowing. 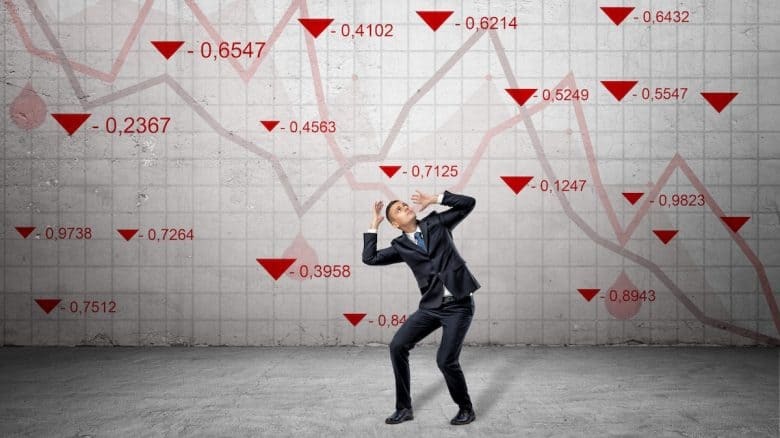 Once they have shorted a stock, they will wait for prices to fall back to previous levels or until new buyers emerge before they cover their position. Or, if prices continue higher, they may cover for a small loss before it becomes a big loss. Their strategy usually is based on a strict trading plan. Arbitragers become active when the gap between stocks and derivatives (futures or options) based on the same stocks gets too wide. In that case arbitragers capture risk free profits by short selling stocks and buying the derivatives. They then wait for the gap to close, before buying back the stocks and selling the derivative. Hedge funds, both market neutral and long / short funds, are both short sellers, but for slightly different reasons. Long / short funds will look for stocks to short where they actually believe the prices of those stocks will fall. Market neutral hedge funds maintain a portfolio of longs and shorts that is neutral overall. They will buy stocks that they believe will outperform the market, while shorting stocks they believe will underperform. In the event of a market crash, the shorts will offset losing long positions, thereby protecting the fund from losses. Large pension funds short sell stocks to hedge their portfolio when they think markets are overvalued. Rather than selling stocks, they short sell the most liquid stocks or futures contracts to reduce their overall exposure. 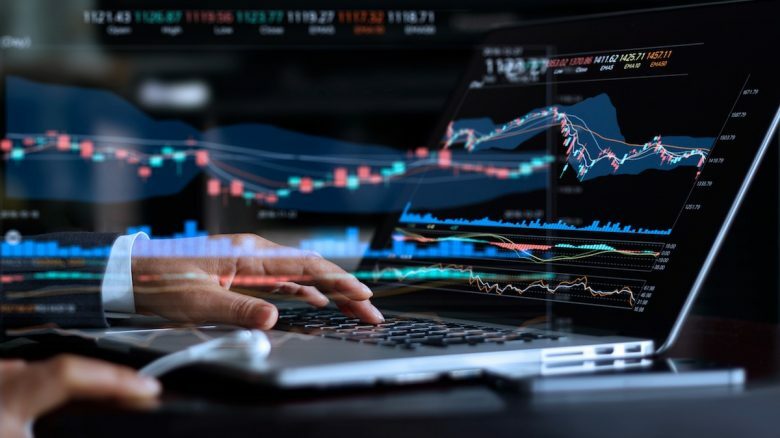 Trading desks at investment banks or trading firms that sell options and structured products use short selling stocks as a means to hedge their positions. They engage in dynamic hedging programs, continuously buying and selling stocks, to keep their portfolios hedged at all times. There is more to shorting a stock than simply entering a sell order. You first need to make sure your broker can borrow the stock and put it on hold. Brokers borrow stocks from large pension funds for a fee of between 1 and 10% per annum – just like interest. When you repurchase the shares, your broker will return them to the lender. In the US stock market, short sales do face some restrictions. That way regulators want to prevent traders short selling stocks to manipulate the price and force it lower. Consequently, when shorting a stock, you cannot sell at the bid price, but must rather wait for a buyer to take your offer. The rules vary from country to country – in fact some countries like Thailand and France do not allow short selling particular stocks at all. Index futures, and sometimes ETFs, are very effective instruments for shorting the market as a whole. In fact, index futures markets are as active as they are because fund managers use them to hedge their portfolios. If you trade CFDs, the entire process of borrowing the shares happens behind the scenes and is mostly automated. 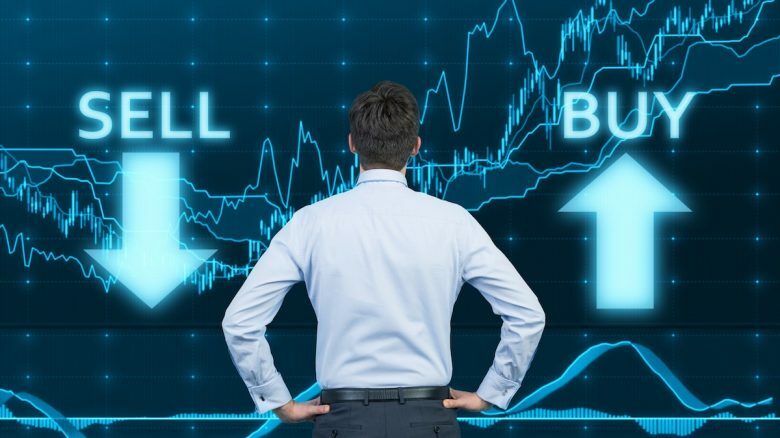 Even if you are not aware of it, every time you open a short position, the CFD provider borrows shares and sells stocks to hedge their own position. Buying put options is another way to short a stock, or an entire stock market index. When you buy a put option, you have the right, but not an obligation to sell the stock at the strike price. So, if the stock price falls below the strike, you can sell the stock at the strike, or sell the option for a higher price. The advantage is that your potential loss is limited to the premium (price) you paid for the option. The disadvantage is that if the stock price doesn’t fall, you lose the premium. Naked short selling involves any short position that is not hedged. If you have a naked short position and prices begin to rise, your losses can add up quickly and are theoretically unlimited. This is especially true if you are using leverage, for example if you are trading with a margin account. This means traders with short positions will often cover positions quickly when prices rise. This in turn can cause prices to rise further, prompting other traders with short positions to cover. When a lot of traders are short, and prices begin to rise, they will often rise very fast. This is known as a short squeeze. Large trading desks will often look for the right conditions to squeeze the shorts out of their positions by aggressively buying stocks. When a short squeeze occurs, there are opportunities to make money on both the long and short side. If you can identify a potential squeeze starting to play out, you can go long, and ride the trend higher until all the shorts have finished buying back the shares. And then, in many cases, a short squeeze will result in the share price being overbought, creating the ideal time to enter a short position to ride the trend back down again. The first step is to identify a potential short squeeze candidate. Obviously, you want to find stocks that have been heavily shorted. 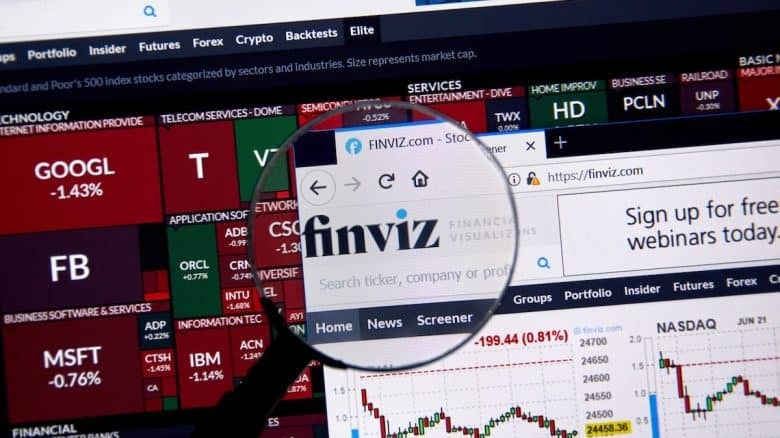 You can use stock screeners like Finviz, which we reviewed here, as a short squeeze screener by searching for stocks with the highest percentage of the float that has been sold short. Stocks with over 15% of the float sold short can be considered fairly heavily shorted. Those with over 25% short have been heavily shorted. However, really any stock with more than 10% of the float short can be a candidate for a short squeeze. Now you can look for those stocks to be oversold and no longer moving lower. The best candidates are also those that are still in a long-term bull trend but have experienced a sharp correction. You could create a short squeeze alert by using a stock screener that searches for stocks with over 10% of the float short, and an RSI below 20. Next, you need to look for upward momentum with increasing volume before entering a long position. 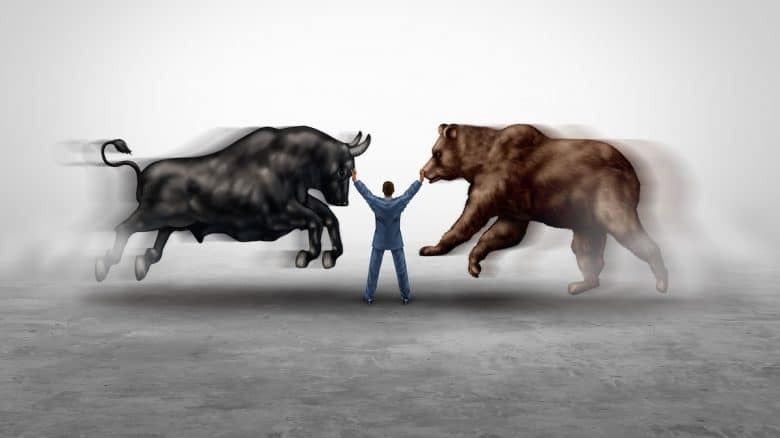 A squeeze is a momentum play, so stay with the trade as long as it continues to move higher. You can even create your own short squeeze ranking tool by sorting for the stocks that are both oversold, heavily shorted and in a primary bull trend. If the stock becomes very overbought and the buying volume dries up, you can look to short the stock. 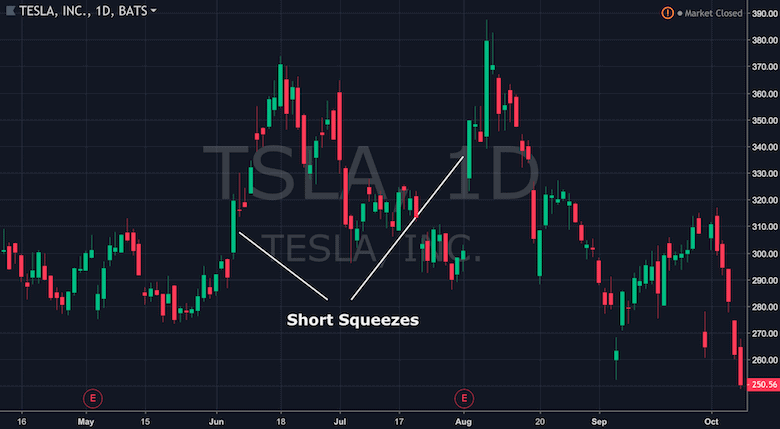 In the Tesla example above, you will see that in many cases after a short squeeze there is an opportunity to short the stock again. Shorting a stock can generate lucrative and quick profits. However, shorting a stock is a lot more difficult than buying a stock. There’s a lot more to it than finding a stock with a market price that you think is too high. Short selling stocks is all about the timing. You need to identify a potential stock to short and then wait for the point at which new sellers enter the market and buyers disappear. When short selling a stock it’s also important to keep your timeframe and potential profit target in mind. If your reason for shorting the stock is based on fundamental research, you may need to wait for months for the stock to fall. If your strategy is based on technical analysis, you should have a target in mind and take profits as soon as the price reaches your target. Short selling stocks is no time to “see how things play out” or hope for the best. We will briefly cover four short selling scenarios here; scalping, short term trading, long term short positions, and pairs trading. If you are shorting a stock as a scalper, you’ll be looking for very overbought positions, potential false breakouts on low volume, or stocks testing resistance with no follow through. In this case, you need to make sure there is very little buying volume before opening a short position. And then, you need to cover the position as soon as it shows a reasonable profit or if the price trades against you to cut losses quickly. 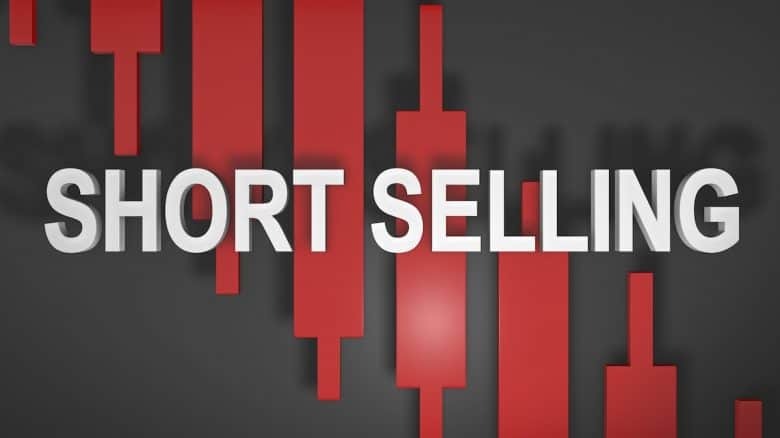 Short term traders short sell stocks when they reach the top of a trading range, and then begin to move lower. They will usually cover part of the position when the price reaches the middle of the range, and the remainder at the lower end of the range. This applies to day traders and to swing traders. In both cases stop losses need to be placed just above the most recent high, and obeyed religiously. Shorting a stock for the long term requires a lot of patience. However, it can work out well if you have done your homework. 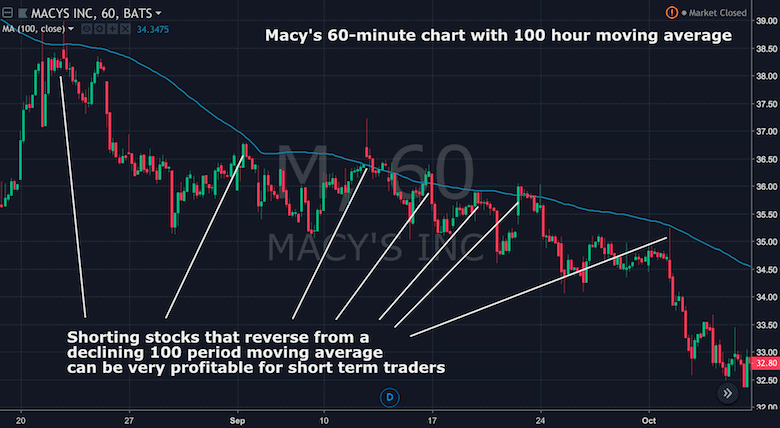 If you identify a stock that has stopped moving higher, that is fundamentally weak and has not been widely shorted, you may have a good candidate for a long term short. As long as the float has not been heavily shorted, there is little risk of a squeeze. And, if your fundamental analysis is correct, investors will gradually lose interest in the stock, causing it to drift lower for months or even years. 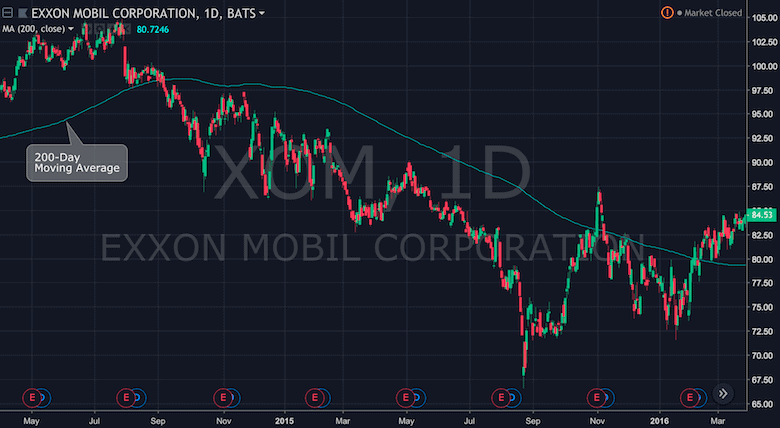 Exxon Mobil was a good example of a long term short in 2014 and 2015. With the oil price under pressure, the stock drifted lower for 18 months. If a stock is trading below its 200-day moving average, it is in a primary bear market and is a good candidate for a long term short. Finally, we have pair trading, which involves shorting a stock, while simultaneously holding a long position in a related stock or a stock in the same sector. These positions can be held for days, weeks, months or even years. They can be based on fundamental valuations, technical analysis or a combination of the two. Even if the stock you have shorted goes up, you can still make money if your long position rises more. It’s all about relative performance – so you need to have a good reason for the one stock to outperform the other. There are several risks to be aware of when shorting a stock. Firstly, the more traders there are shorting a specific stock, the more risk there is of a squeeze. Try to find trades that are not already overcrowded. Shorting penny stocks is very risky due to lack of liquidity. Sometimes when illiquid penny stocks are recalled by lenders, traders are forced to cover their shorts in a market with no sellers. This can create a massive short squeeze, with prices rising 50% or more in a day. Several hedge funds have been ruined by these situations. The moral of the story is that you need to be very careful short selling penny stocks. Not all brokers are well equipped to handle short positions. If a broker does not have relationships with several lenders, there’s a risk that the loan will be recalled at any time, forcing you out of the position at unfavourable prices. It’s worth remembering this when looking for the best broker for short selling stocks. Setting and obeying stop loss orders is always important when trading, but it’s even more important when short selling stocks. If you are short, there are probably lots of other traders short too. You never know how far a short squeeze can go. It’s best to get out and try again when the squeeze is over. Some online brokers offer guaranteed stops which are a great way to limit risk when you are shorting a stock. If you are trading with leveraged instruments or a margined account, you should use less leverage than you would on a long position. Stocks that are widely shorted are prone to more volatility than average stocks. That means shorting a stock carries more risk than the average trade. You now know the various reasons for shorting a stock, how to short a stock and the risks to be aware of. Before rushing out and short selling stocks, it’s a good idea to paper trade while you build a short selling strategy. There is less room for error when shorting stocks, so you’ll need to learn some of the nuances to shorting. This is something that for example comes with practice on a demo account or with trade analysis while paper trading your strategy. While learning the ins and outs of shorting a stock is something that takes time to learn, it’s a very valuable skill to have. 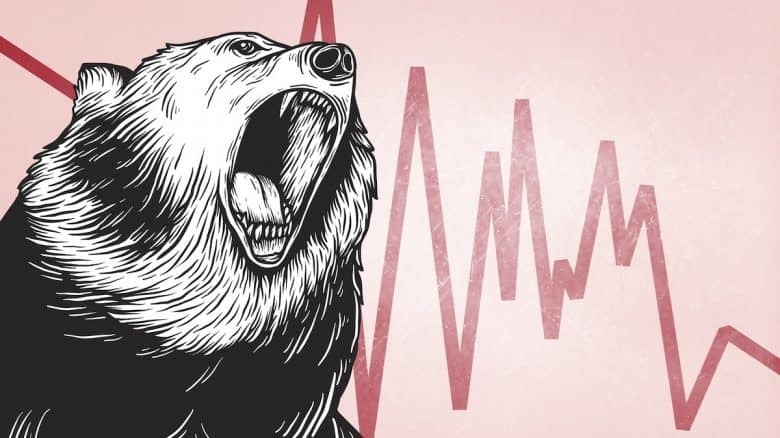 After a ten-year bull market, the chances of a bear market are higher than ever. Being proficient at short selling stocks could be very lucrative in the next few years. What is your view on selling stocks short? Do you have any questions? Please share your thoughts and feedback in the comments below.